I'll update later... have lots to tell! 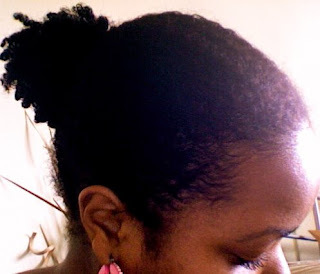 So today I realized that I woke up with the same pony/bun I've been rocking since Sunday! You have to know why this is exciting! 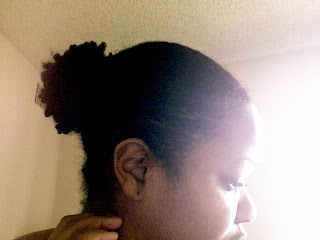 See.....I can NEVER rock a pony/bun for more than a day. I sleep entirely too hard, and I literally change clothes 2-3 times a day LOL (don't ask... just a girly thing). My buns have never survived the battlefield that I call my day. I wrap it at night, and the scarf slips off. I end up bare on the satin pillow, and that honestly doesn't help keep it in place either. LOL! Anyway, to the point.... I'm on day three, and this thing still looks good. 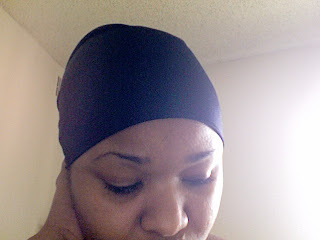 I wake up, add a little shea butter to my life, put the wrap back on until I'm ready to walk out and voila! The only difference that I have made is that I add a little butter and water right before I go to sleep. I do a slight run with a boar brush, and then wrap. I sleep wild, and after seeing how well how this has worked I guess I have concluded that....when my hair is completely dry my scarf will never stay in place. So.... from now on moisturize before you lay it down. So.... I'm one of those people who are big on healthy eating, but usually fall off of the wagon after about a month.... beeeeeggging for excess dairy and sweets! With this said... all the talk about a healthy diet and hair growth got me to wondering, so I tried conducting my own research. tehehehe. I was always sure that this theory had validity, but I was more sure that it was valid in conjunction with decent hair care as well. I believed it had more to do with the actual hair care. I started working out on March 24, 2009 with my trainer. He keeps me on a STRICT diet with a daily intake of 1500 calories that consists of all the necessary food groups. I continue to take a mutivitamin, but, in order to see how effective this would be I stopped taking Biotin and MSM. I think this theory may have truth to it! I work 1 hour sessions 4-5 times a week. I watch what I eat... the most dairy I have eaten is cottage cheese lately (which I have come to enjoy...along with pineapples LOL). I have not taken MSM or biotin, but I have kept up with my mutivitamins. ("The boy" isn't always around. LOL). I wet my hair for the before pic because I figured that the water would stretch it for me. A little past... maybe sitting right on my shoulders. problem in this arena, but I'm another case.... "See Imma let it do what it do babay!" to style this morning, and the results were self astonishing. I actually can't believe that I did it... I'm feeling really unbrella ella ella ay right now! Chhhheeeea! LOL! I sectioned my hair into 4. ... and again... that's about it! LOL Took 10 minutes top! I told you I would come back and review Herbal Essences Hydralicious after I tried it again right? the sugar honey iced tea baby!!!! 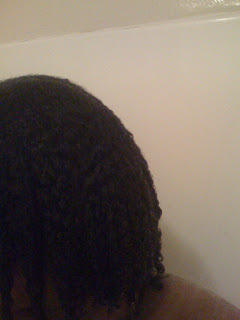 Now....my hair isn't too fond of wash and go's, but for lack of time I did one with this stuff today....... Whoo child! This is directed at one of my friends in particular... you know who you are, but for now we'll just call her Jo...LOL! 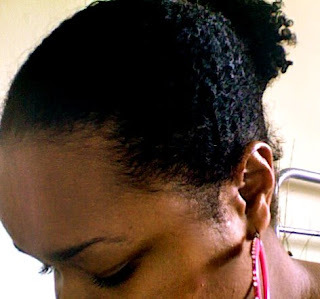 We had an intense conversation about textured hair yesterday and I don't believe that I said everything that I really wanted to say for fear of being pinned as a "radical natural". She knows that I'm putting this out there so... for the record I'm NOT putting her on blast! LOL. Me: I like being natural. I feel like there is so much more to me now. What's funny is 5 years ago you would have never heard the word natural come out of my mouth... well in reference to me anyway. Me: "No, I don't know... explain." Jo: "My hair doesn't grown like that. 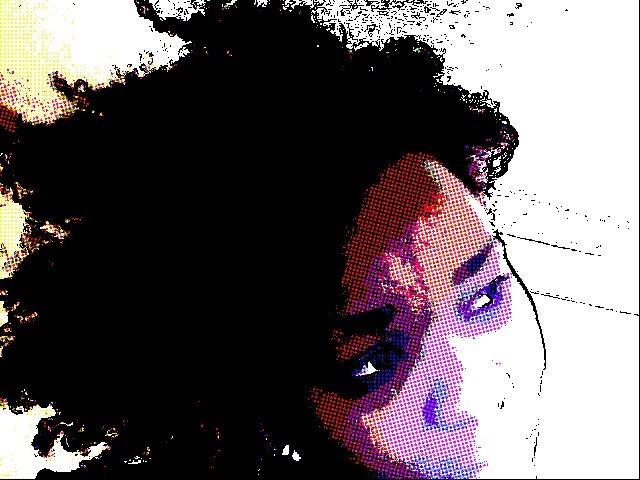 I think you got white or something in you, cuz regular black people don't have hair like that." Me: "Wait, so regardless of my ancestry... black people don't have curly hair or wavy hair? 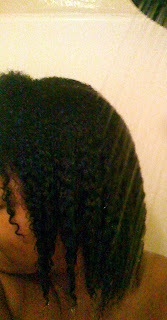 I actually thought black hair was typically defined as tightly packed curled or coiled hair? Me: "WOW! Are you really serious right now?" Jo: Yes, all I'm saying is that most black peoples hair doesn't grow like that. "Think about most of the black women you know. 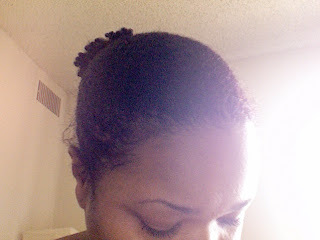 It's either short and spiked, shoulder length, or weaved up." Me: "Okay, so then why do you think that is?" Jo: "I don't really know, and to be honest I don't really care." Me: No seriously, let's talk about this... I'd like to know why you feel the way you do. Me: "No, I just think it's interesting." I mean I can understand where you're coming from because I used to perm too, "but I don't ever think I thought that my hair wouldn't grow. 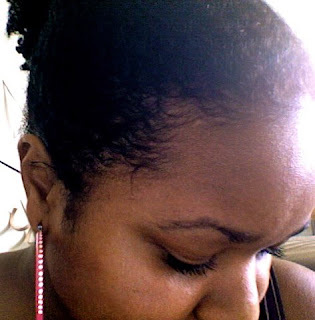 I knew that growing it could be more of a challenge, but I don't think I ever thought my hair wouldn't grow." Me: "Oh, so again... you're saying that black people don't typically have waves right? Well then what about dudes? Remember when guys used to brag on their waves... Unless they're rocking texturizers [laughs]... that's all natural. How do you explain that?" Me: "No, it's kinda not." Jo: "Whatever. All I know is dealing with 1 inch of hair is different from dealing with 10." Me: "That's true, but the point is that it does grow like that it's all in how you care for it. Remember how the guys used to walk around with their brushes. They slept in the wave caps, kept their grease in the car? [laughs] It's the same thing, only it's longer. You have to learn to pamper your hair the same way. I spend more time with my hair now than I ever did before. That's ALL I do." Jo: "Okay... like I said... your hair ain't regular. You can keep talking, but that's real." 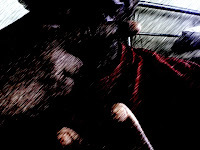 Me: "Okay "Jo"" I'm not even about to go there with you tonight [laughs] Matter of fact Imma put this up on my blog. I want to remember this conversation when you're natural [laughs]"
It went on a little further, but that's the jist of it. Those feelings of inadequacy are much deeper rooted than your hair. I wish that you and others who feel this way would truly wake up and see that. You say that you see it. You talk about it like you know it exists, yet you do nothing to stop it. I personally don't think you notice it. I think you have been conditioned. You are conditioned because your ancestors were conditioned. Feelings of inadequacy have been passed down through generations of our people. I for one will NOT continue that "tradition". This feeling is NOT inherent...... it is learned, and it is up to you to recognize it so that you may change it. Change it for the betterment of yourself, but most importantly for the betterment of your children. We as a people HAVE to wake up! *Call me radical if you'd like... I speak the TRUTH! If you won't say it... hand me the mic; I WILL!